Illustration © Neil Packer from The Folio Society edition of Joseph Heller’s Catch-22. Catch-22 is one of those books that everybody who enjoys literature ought to read at least once in a lifetime. That’s not to suggest it’s an overly-serious and inaccessible work, but more that it has something worth saying, and it deserves its continued reputation as a stalwart of ‘must-read’ shortlists. Catch-22 retains our interest as a way of understanding the Twentieth Century and shining a satirical light on one of the bleakest parts of it. By popular demand, The Folio Society has re-issued its hardcover edition of the modern classic American war novel. 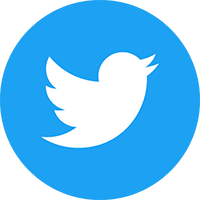 Written by Joseph Heller in the 1950s, first published in 1961 and set during the Second World War in the 1940s, the world of Catch-22 is inevitably shaped and distorted by the paranoid prism of the post-war Cold War-era in which it was conceived. This backdrop renders the leading characters powerless pawns in a frightful bureaucracy that plays games with their lives. There is more than a touch of Jewish humour to enjoy: the narrative is in parts absurd and delightfully funny, but without ever losing sight of the gravity of the subject it is satirising. Joseph Heller drew on his own experiences as a bombardier during World War Two in creating his detailed fictional landscape, and there is perhaps an element of the author’s personality in the central character of Captain John Yossarian. We meet him for the first time in the hospital, doing his best to avoid combat and thus stay alive, which is his primary motivation throughout the story. The weak and feeble Chaplain Tappman suspects Yossarian is faking his maladies, but is too timid to either inform his superiors of the Captain’s pretence or make a case in his defence. The book is full of such delightful paradoxes and delicious irony. Catch-22 is not a straightforward, linear narrative. Heller doesn’t hold his readers’ hands and gently guide them through different time-streams and multiple complex character arcs. Rather, the best approach is to enjoy the prose as you read it and keep your wits about you. The literary style is not thick and impenetrable – quite the opposite – it’s lively and engaging: but fresh and alert readers are rewarded. 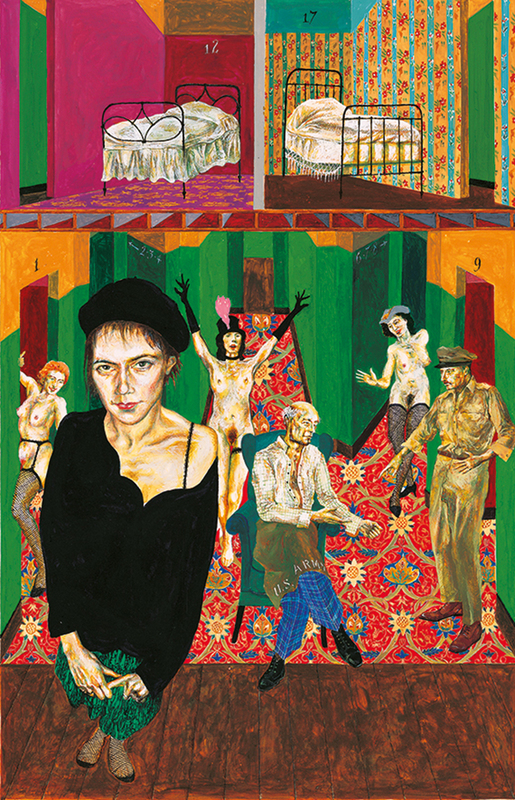 As the late Malcolm Bradbury (The History Man) points out in his introduction, Heller’s most famous work follows in the tradition of satirical takes on war such as Hasek’s The Good Soldier Svejk, in that the protagonist takes the war personally, and wishes to assert his right to make decisions for himself in an environment where individualism has no place, and sacrifice for greater ideals is taken for granted by those in authority who decide the fate of lesser men. The enemy is not Germany, or Japan, or Russia – they barely feature in the novel at all – rather, Yossarian’s conflict is between his desire to survive and the orders of Colonel Cathcart, General Dreedle, and a host of superiors who expect him to constantly endanger his life for the greater good. Catch-22 is one of those rare novels that gets better each time you visit it. Chronological connections you didn’t notice the first time around reveal themselves on the further exposure. Some secondary characters come more to the foreground, and their quirks amuse. I kept smiling every time Scheisskopf calls somebody a ‘wise guy’. People don’t say that enough now. 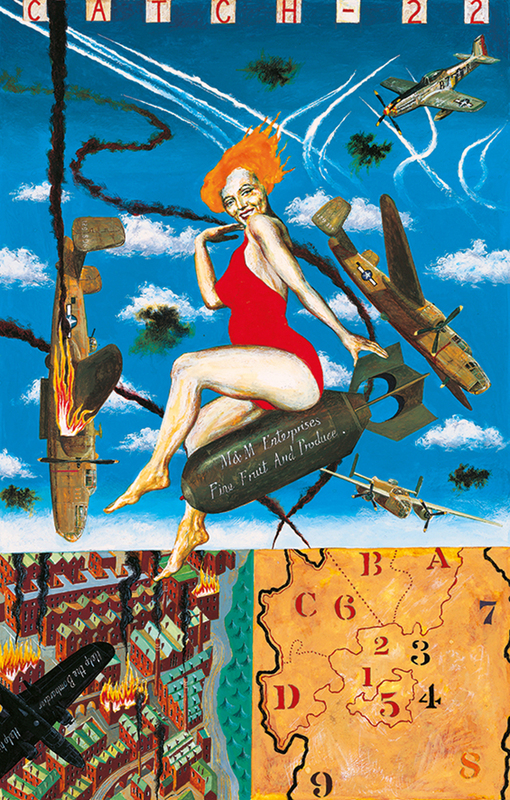 The Folio Society’s edition of Catch-22 is illustrated by Neil Packer. There are eight one-page full-colour illustrations, which are rendered in the optimistic style of WWII propaganda posters. They feature much-loved characters including Doc Daneeka, the shrewd Milo Minderbinder and the unfortunate Nately. The soft cloth-bound hardback cover is a delight to hold in your hands, and it is embossed with imagery from the novel – bombs interspersed with a needle, a cigarette lighter, a naked woman… If you’ve been meaning to get around to reading Catch-22 but haven’t yet done so, then this luxurious edition is the best way to enjoy a modern classic. 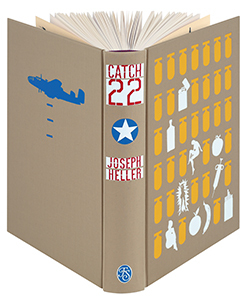 The Folio Society edition of Joseph Heller’s Catch-22, introduced by Malcolm Bradbury and illustrated by Neil Packer, is available exclusively from The Folio Society.